Sen. Lindsey Graham’s has charged that the White House engaged in “seedy Chicago politics” to get its health reform bill passed. “It was definitely a cheap shot and completely unwarranted,” Valerie Jarrett, one of several Chicagoans who came to Washington with President Obama, said of the South Carolina Republican’s recent remark on CNN. I suppose Graham would prefer seedy South Carolina politics – such as a family values governor, Mark Sanford, claiming he walked the Appalachian trail, while he was flying to South America to shack up with his mistress. And, who can forget Rep. Joe Wilson who screamed “you lie” at President Obama during his State of the Union address. Such decorum and southern hospitality. Or, how about when John McCain lost to George W. Bush in the 2000 Republican South Carolina primary, after the Bush campaign insinuated that McCain had an out-of-wedlock black baby? Let’s not forget that for decades, Republican presidential candidates were forced to pander to racist Bob Jones University if they hoped to get the nomination. It is sad to say, but the absurd Confederate Flag issue is still a big deal politically in this state. Of course, the most corrupt, sleazy political operative of all, Lee Atwater, perfected his craft in South Carolina. And, let’s not even get into the career of the late Sen. Strom Thurmond. 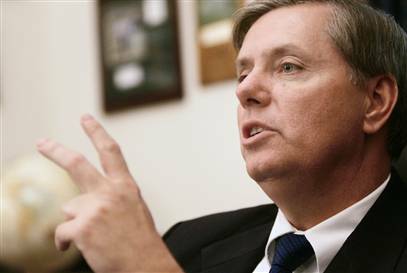 Sen. Graham, please spare us the disingenuous, sanctimonious lecture on the morals of South Carolina politics. This type of opportunistic regionalism is obnoxious and divisive. For the record, I’m not picking on South Carolina. I am from Miami, not exactly a hotbed of political ethics. But, Graham just looks plain foolish insulting Chicago, when political corruption and immorality in his state is at least as bad, if not worse. The last thing we need is this windbag insulting the Windy City.